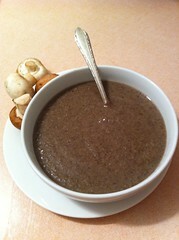 This French recipe for mushroom soup is something that I would ask for at my last meal. It's so delicious, I have seen it win over mushroom haters. It has been passed down to me from my mother, who has a wonderful book where she gets all her most delicious soups from called The Cooking of Provincial France (A Time-Life publication from the late '60's). The next few posts will be an exploration of these soups, which have warmed my tummy on cool fall days since I was very young. 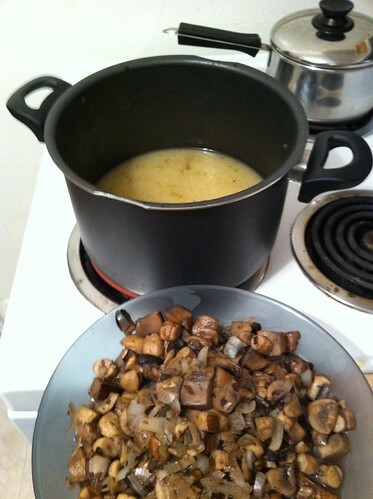 The original recipe, Potage Crème de Champignons, calls for 3/4 c of heavy cream. This makes for a very heavy soup, and if you are lactose sensitive like me, it's just unpleasant. It is an option for those so inclined. This version of the recipe includes some of my mothers tricks (and simplifications), handwritten in the margines. 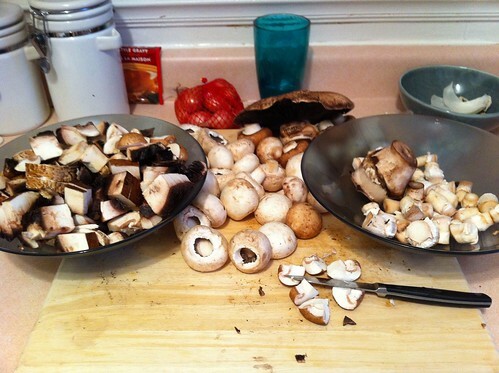 Separate the mushroom caps from stems, roughly chop the caps and place 3/4 in one bowl and 1/4 with the stems. Finely chop the shallots and set aside in a separate bowl. In the soup pot, melt 2 tablespoons of butter on medium heat. When the foam subsides, add the chopped mushroom caps. Toss them constantly for a few minutes with a wooden spoon until they have darkened in colour and softened slightly. Remove them from the pot with a slotted spoon and set aside in a bowl. Melt another 2 tablespoons of butter in the same pot, and cook the mushroom caps and stems as well as the shallots for a few minutes, tossing constantly. 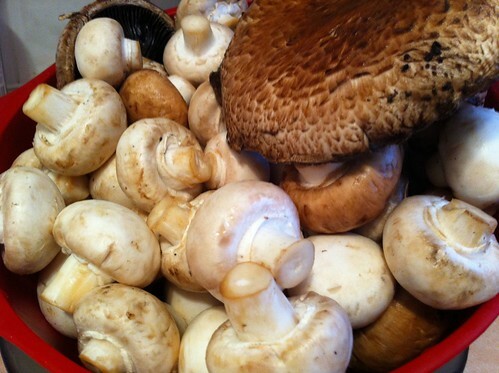 When the mushrooms are darkened and slightly soft, pour contents of pot into a bowl and set aside. Making a Roux: The purpose of a roux is to help thicken the soup. It is an optional step. Melt the remaining 2 tablespoons of butter over moderate heat. Remove from heat and stir in the flour, cook over low heat for 1 or 2 minutes, making sure not to brown the roux. Remove the pot from heat for a few seconds (to cool), add the water (or stock), wisking constantly. Return to heat and boil until the mixture is perfectly smooth. 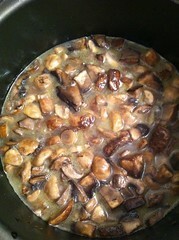 Add all the mushrooms and shallots, simmer and stir occasionally for 30 to 45 min. Salt and pepper to taste. Transfer the soup into a large bowl and purée with a hand blender (or blender) until desired consistency. I like it smooth and creamy, it gives the illusion of enjoying a thick creamy hearty mushroom soup without the cream! This soup is a great for dinner, as a starter with a full holiday meal or with a salad on any old night of the week. I enjoy pairing it with a hearty spinach salad, that can double as a wonderful mid-day work lunch.